Well really, it is a Cricut Expression and it's pink and it's all mine!! About a year ago I purchased a normal Cricut machine for all of my scrapbooking projects. What is a Cricut you ask? 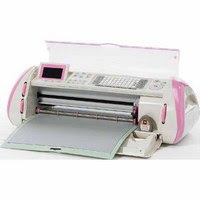 Well a Cricut machine is a personal die-cutting machine used with small cartridges that you purchase in different fonts and shapes. I have about 10 cartridges right now and I use them to make shapes and titles for my scrapbook pages. The one I purchased way back when was a small 6x12 machine. I had to cut all my 12x12 paper down to fit. And of course, a few months later out came the Cricut Expression which was 12x12 and allows you to cut out vinyl lettering for your walls and etch onto glass. I never purchased this larger machine even though I wanted one. Every time the infomercial came on TV I would sit and watch it, longing for $400 to purchase my own. THEN - they created Expressions in different colors! They made blue,red and then pink to support Breast Cancer Awareness and it came with three cartridges. The machine was only sold through Micheal's and of course, is no longer available. But oh how I wanted one. Over the past week I began looking on Ebay for machines on sale. The problem was people were taking out the limited edition Journey cartridge (the breast cancer cartridge) and then reselling the machine! I wanted all of the cartridges and the more I searched, the more I wanted it now! Then on Sunday, I get a text from my future hubby that says "I hope you love me." I knew, JUST KNEW that he had found a machine for me and purchased it! I was so excited when I got home and he told me my brand new, pink machine with all 3 cartridges would arrive for me on Thursday. Isn't it BEAUTIFUL?! I can't WAIT to begin my new projects! And of course, I love my fiance tons for taking the time to find a Cricut Machine! I'll be sure to post some of my projects in future blogs to show everyone how amazing this machine truly is! As the weekend winds down. Top Two Tuesday - Thanks Kelly!